Philippe Close, mayor of the city of Brussels, welcomed other speakers and the participants before European Commissioner, Karmenu Vella gave a keynote address. The Commissioner strongly supported the key messages of the campaign – to involve, inspire and impact – while highlighting the central importance of people in city life. Daniël Termont, president of EUROCITIES and mayor of Ghent, opened the panel debate, sharing his pride in the 85 cities that have, so far, shown their support for Cities4Europe.
.@DanielTermont in public debate of #cities4europe: "I am convinced that in 10, 20 years time decisions will not be made in the city hall anymore, but by the people on the street. And the role of politicians will change fundamentally." During the panel debate, Gilles Pargneaux MEP, said that "participative democracy and citizens' consultations have the potential to reconnect us with the European project." Philippe Van Parijs, the Belgian economist and philosopher, suggested that a key part of citizen participation relies on a two way dialogue, in which local people also suggest ways in which they can help. This point was shared by Saskia Sassen, the sociologist and professor, who said that we need to use technology as an enable to tap into people's ingenuity. Philippe Van Leeuw, Belgian film director; and Ingrid Pecquet, director Recyclart, completed the panel. The debate was followed by a cultural reception, which featured the vernissage of two paintings by Vincent Glowinski (Bonom), and a performance by artist Nayra Martin Reyes (EUtopia). May 7 marked the beginning of a fantastic journey that will lead to the organisation of more than 200 Cities4Europe events in the 85 EUROCITIES member cities that have already joined the campaign. ...And get involved yourself: send us your ideas on the future of Europe by filling out this online postcard! 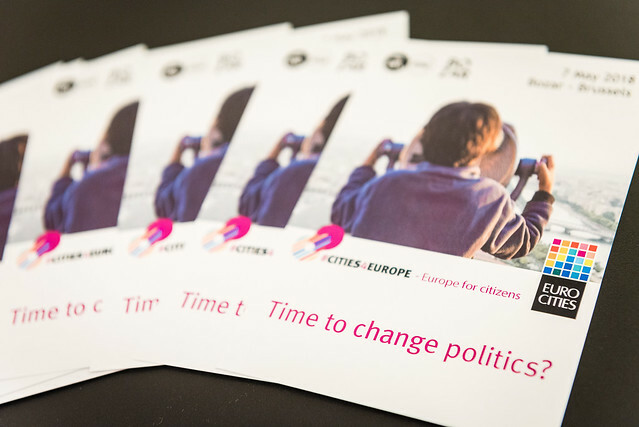 Citizens ideas on the future of Europe, and cities recommendations on how to involve citizens in the decision-making process will be presented at EUROCITIES 2018, taking place in Edinburgh on 28-30 November 2018.